It's because of knitting. Before I made clothes, I never thought about them. In high school I just wore whatever. Maybe a a 60's drop waist dress I'd find at Goodwill, or a kilt I'd get at the GI surplus, but usually baggy jeans and a t-shirt. There was no planning, no rationale. That's the way I am and I like it. Worrying over outfits seemed not only boring, but even a little wrong to me. I didn't want to be part of my culture's obsession with appearance. I was raised to think our beauty comes from the God who shaped us, just because He wanted to, not all the things we add to it. Focusing on the way I dressed was counter-intuitive. But here I am, writing post after post about sweaters, fit, pairings, etc. The high school girl inside of me has had her eyes rolled all the way back in her head for a couple of years now. Of course I don't have to explain myself to you. You are, most likely, just as obsessed with hand crafting things. Even if you're not, I realize I owe no explanation for the thoughts I choose to share here. Still, there's that girl in my head, tapping a Dr. Marten- ish boot in boredom, critiquing the length and content of such a post. She's got a running commentary going through every FO shot, though she knows my obsession with making clothes isn't so much about the clothing as it is the wanting to see how it's done. I want to figure it out, see if I can do it, get the satisfaction of working with my hands, and then wear it like a badge. I think that's why trying crochet was so satisfying. It was a very different process that satisfied my curiosity. She also knows that I crave the rhythmic clicking of needles, the steady work with my hands, and the conversation that grows around a group of women (and men) making stuff at the same time. So there are a few actual human needs involved here: the need to learn, the need to make, and the need for community. I guess I also need to hold onto the feeling of the process by wearing the product. I get so much satisfaction out of putting on something I made. Whereas I once just wore tank tops and cut-offs all summer, I now have beautiful reminders of the creative process to wear over my wife-beaters. Classy, right? Perhaps all this focus on creativity and using my hands seems wasted on something as trivial as a garment. Couldn't that energy be channelled into something a bit more meaningful? (This is how that hard voice in my head sounds.) Maybe. But, Dude, I made children. I made family work, even when it was hard. I am raising them with my eyes completely open to who they are and who I am and was. I see the good and the weak. I hurt along with people, and I smile with people. I struggle and forgive. I breathe deep and ignore. I create good moments for people nearing the end of their lives on a regular basis. I choose sacrifice, like so many other people I craft along with, daily. I consider and consider and consider the heck out of life, death, family, Christ, and my place in all of it. I know there are lots of other people doing equally difficult things. Things that are independent of career, education, family status, and age. All of us desire to work hard, to be good at what we do, and live for something bigger than ourselves. And a few of us escape for a few minutes, or hours, a day into the narrowly focused world of garment crafting. So, let me make my top, tank, or tee in the evening while the tv blares, okay? That was all for my own benefit. I know you weren't judging. 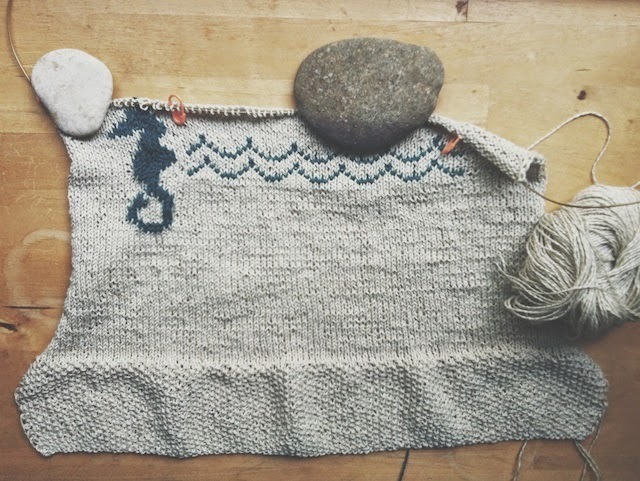 I'm making progress on my Hawt Sands, by Teresa Gregorio, for the TTTKAL each evening. It's in hemp, which is freaking me out. It seemed so small, that I've ripped back and restarted, knitting a 33" and expecting to get an inch worth of stretch when blocking. If it turns out larger than that, I'm okay with it. It is a cover-up kind of thing. 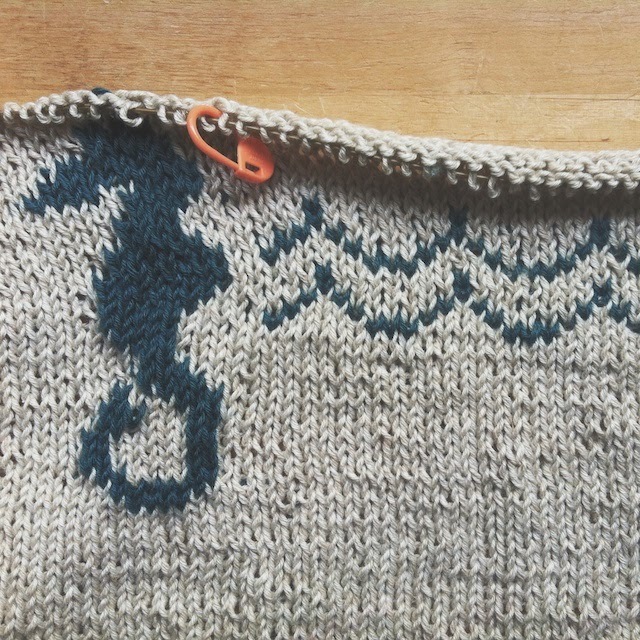 The intarsia- fair isle colorwork I'm doing isn't stretching as much as the rest of the top when I yank on it. I'm hoping it won't be tight after blocking. This would never be a problem for me in wool. I forced myself to knit it very loosely to avoid this, but I'm afraid it will be one of those after-blocking suspense moments. I'm finding Hempathy a worthy experiment, only it falls out of the ball and into a puddle of knots soooo easy. I don't feel like I can take it off of my couch, so it's a knit at night project only. For my grandparents' house and doctors' offices, etc. I have the Fire Opal Tee. 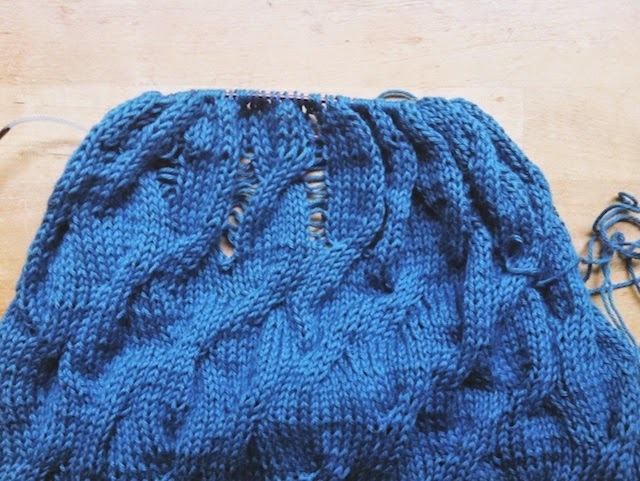 It's in the robotic, memorization stage of knitting. But, I'm pleased to say, I'm about to shape the neck and be done. There are so many great projects on the TTTKAL Pinterest board. This could keep me busy for years. That's right, years, Girl-in-my-head! First off, Holy smokes that first picture is your daughter all over! Secondly I can so relate to this post. All about the making the pretty things but most days I really don't care what I'm wearing. I was the tom boy in school, liked wearing my brothers clothes and dad's huge sweaters. Accessories just aren't me and never were, I remember a time when I tried to be all cool with accessories but I now realise that's just not me and I am completely ok with that. These days I find myself crawling back to everything that is comfy! I love this post. :) My inner high school girl wants to know why I didn't start knitting in junior high. Think of all the cute stuff I could have worn that I couldn't find in stores (because no one else wants to wear anything I do)! I wouldn't have had such a strange, nerdy style if I had been able to make my own clothes. I wasn't concerned with style either, but I certainly never really felt comfortable in anything I wore. if being one of those girls includes being beautiful in body and spirit and knits like an expert then yes, that's you. wow that photo! That pinterest board is very inspiring! It's the same for me when talking about clothes. I never enjoyed shopping (I still don't) and I was the oddball of the family whenever my mother and sister proposed to go and check some clothes shops. I think I have discovered a completely new dimension about clothes and myself with this me-made. Making things with my hands relaxes me and has taught me to not leave things unfinished. I'm proud of wearing something I made and I don't mind if it's not 100% perfect. It's unique and a way of fighting out consumerism. The thing about the inner critic is that she just won't shut up! This I know. :) You're doing brilliantly with your one wild and precious life (a la Mary Oliver). Ha! I didn't even think about it, but yes, I did look a lot like her! I wore my brother's clothes too. But lots of people dressed that way. It's what we call "boyfriend jeans" and "slouchy" now, right? I'll always be partially stuck in the early nineties, I'm afraid. Vanessa, I never felt comfortable, period. But, yes, I agree! I had so much free time back then and would've probably been more experimental. Of course, I probably wouldn't have been able to escape strange and nerdy, only it would've been my strange and nerdy creation. Better late than never. Oh Lori! You're making me smile. Thank you. I don't mind being "one of those girls", which really means like any girl. That inner voice has mellowed enough that I actually enjoy listening now. Does that make sense? You are very inspirational on that front, too, Elena! I believe a lot of us are turned off by the process of clothing ourselves and the excess. (I won't say much about excess because of the size of my yarn stash, but you know what I mean.) I don't like the ideas placed in the heads of young girls about what "fits" and looks best on them, or how they need to buy something to be normal. But mostly, I dread mall lighting, the loud music and perfume! that's overpowering. Have you ever been in a Hollister store? It's like being in a bar, in a dark cave, where someone spilled a bottle of cologne! Making it ourselves allows us to determine what fits us, what experiences we associate with the process, and leaves a sentimental attachment to the thing we're making. No impulse buying here. It all has to be considered. We also tend to consider the longevity of an article of clothing more. Thanks for bringing that up here. Oh, Veronica, I'm so glad you mentioned that poem. I've never read it, but searching for it led to poem after poem I could devour. Thank you for taking the time to tell me this. I have gone from being bullied by my inner critic, to almost pitying her, to loving her like a sister. She makes me laugh, often. Hehe, I'm just now seeing this. I forgot I wrote this post and so enjoyed re-reading it, as if for the first time. I guess I've slowly made my way toward being proud of how I express myself outwardly- at least in the winter. 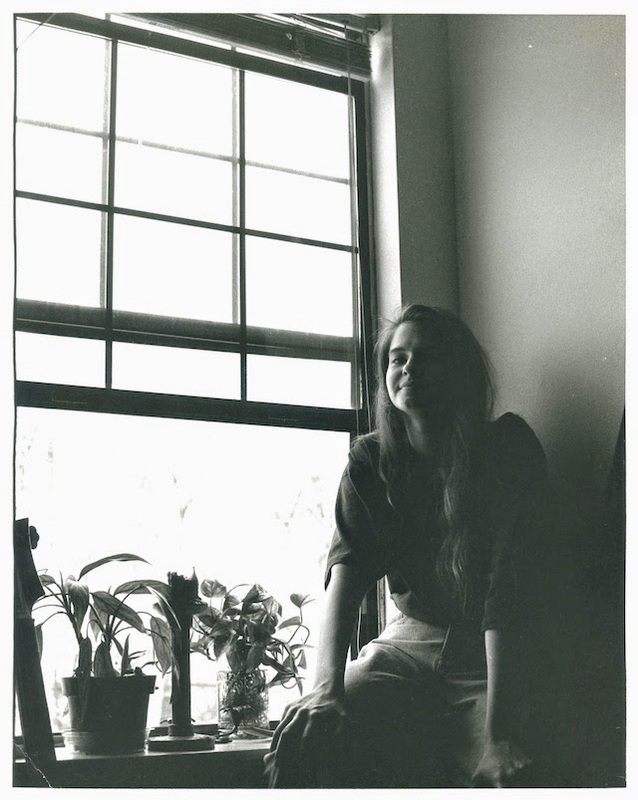 ; ) I think I was a bit anti- surface as a teen, which had it's merits, but did deny the most outward part of myself. I was pleased with myself for who I was, but I was also repressing myself , somewhat. I was inhibited and slightly hidden. It's weird because the uninhibited me isn't all that different acting, but it does feel different to just embrace everything about myself- from my deepest desires to what sweater I'll wear tomorrow. Plus, making my own stuff is just really clever. Thanks for the perspective, Katie!